Many people have such confusion, obviously buy 10000 mA power bank, but to the battery capacity of only 2500 mA mobile phone charging, often less than three times full charge, the power bank there is no electricity, in the end is how it happened ? What is the power bank manufacturers virtual standard capacity or other reasons? 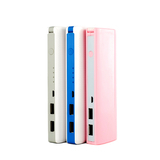 Here power bank manufacturers Jia Yang Mei and spectrum to everyone and this knowledge. And then the phone can get the power is not the above 6290mAh, because of air humidity and temperature and other environmental impact, the power bank in the process of charging the phone will have some loss, and the data line itself in the transmission of energy will be Because of the loss of resistance and loss of some of the power, so ultimately can reach the phone's power will be lower than 6290mAh. Mobile phone battery power and power bank is also maintained at about 3.7V, so power bank transmission over the phone itself will be a step-down process, this process will undoubtedly also lose part of the power, which is why Many mobile phones when charging will cause fever. At present, the standard voltage of the batteries of the commercial power bank is generally maintained at about 3.7V, so the actual power of the 10000mAh power bank supply is 3.7V × 10000mAh = 37000Wh, and the voltage of the mobile phone is 5V. According to the law of conservation of energy, When the power bank supply boosts the output current to 5V, the capacity of the power bank supply is 37000Wh ÷ 5V = 7400mAh. The 7400mA here is not the ultimate energy of mobile phones, the power bank for the phone charging process, the circuit board boost and security chip operation and so will consume some of the power, so the conversion rate of power bank is generally about 85% According to 85% of the calculation, the actual output of the power bank maximum capacity of 7400mAh × 85% = 6290mAh. In addition to buck, the state of the phone during charging also affects the actual number of charging times for the power bank source. If during charging, the mobile phone is playing games, watching video, listening to music, watching novels and other high power consumption state, it will further affect the power bank to charge the phone the actual number of times; if the phone is in the daily standby state, the actual Charging times also have some impact. The ideal state is off charging, but Xiao Bian believe that not many people will turn off charging it! I believe everyone has seen here that power bank charging for mobile phones is not only a simple capacity divided by the capacity, but many people will fall into misunderstanding, since all power bank needs to experience the appeal process, then the greater the capacity of the higher the conversion rate power bank must be better and more practical. 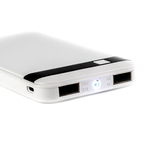 But in fact not the case, we do not say that the power bank supply is only used as a backup power supply urgently. The huge capacity of the power bank supply itself is a long matter, and the corresponding capacity is larger, the charging time The longer, if only in order to hurry up for some of the electricity base, not as good as the choice of smaller capacity is more appropriate. Besides conversion rate, in order to protect the safety of products and users, large manufacturers will add some of the necessary safety components on the circuit board of the power bank supply, even sacrificing some conversion rates are also at the expense of manufacturers to increase product gimmicks, Will often remove the necessary protection of the pieces, leaving security risks. Therefore, power bank manufacturers Jia Yang Mei and remind everyone to buy power bank, please do not over-fan conversion rate, in general, 85% is a reasonable level, too low can not protect the life, too high may exist Security risks.